First of all, my apologies for getting the mustaches upside down! Oops! Some more great fabric choices by Kristina. We are now into the section of blocks classified as rectangles. Tammy is looking pretty comfortable in her tidy room that makes many of us envious! Truth be told, she has had plenty of time to make the place neat while she has been healing up from a broken foot. She is back to walking with only a hint of a limp, so she will soon be ready to get back in the swing of things at the store. In spite of her injury, she still has found time to take care of our flower boxes and flower beds. She has the greenest thumb around! The dirt in the back of the store is bad stuff, cement-like, and full of weeds. Last summer Tammy started working her magic back there, and now we have some success with some hardy perennials to beautify the back of the Patch. Thank you! Tammy is a collector of The Ghoulies, as you can see in the project on the right on the design wall. To the left, you can see one of her original works, a fabric portrait of one of her beautiful daughters. Thank you for inviting us into your sewing haven, Tammy. 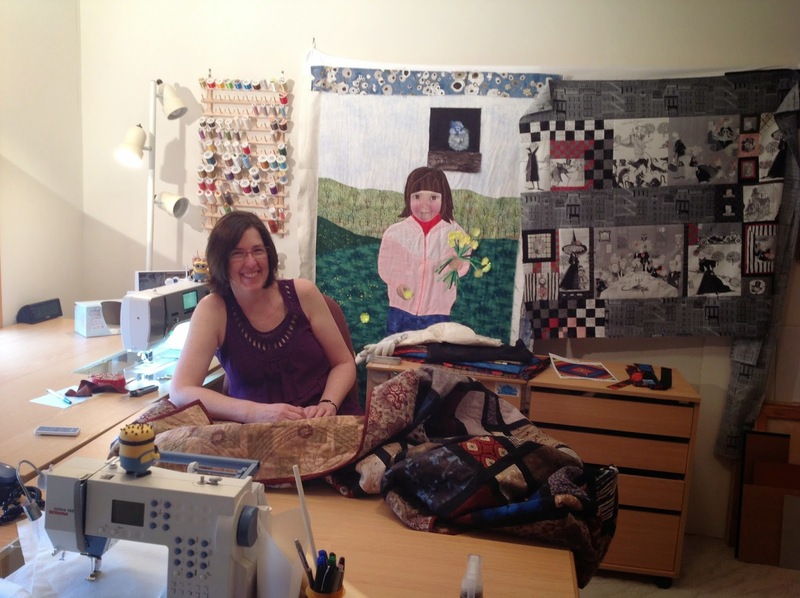 Our next block posting will include a special peek behind the scenes at Debbie's sewing room.